Other personal links (Not related to APRS): On Electric Vehicles and Solar Power, or my Energy Choices book. APRS is now in its 25st year! APRS is digital communications information channel for Ham radio. As a single national channel (see map at right), it gives the mobile ham a place to monitor for 10 to 30 minutes in any area, at any time to capture what is happening in ham radio in the surrounding area. Announcements, Bulletins, Messages, Alerts, Weather, and of course a map of all this activity including objects, frequencies, satellites, nets, meetings, Hamfests, etc. The APRS network has grown to most countries with strong Amateur Radio populations. . . . . . . . . . . . . APRS-by-Bob Powerpoint (8 Mb) (Feb 2015 version). This page evolves over time. New stuff is posted here at the top. Older stuff migrates downward. To see the full description of APRS you have to drill downward pretty far. But it is there back to the beginning (1992). Is it your radio? Since packet begain in 1978 too many people use it as a plug-N-play mode where you just connect your TNC to the radio and begin operating. Sure, it probably "works" on some strong signals, but could be suffering 10 to 40 dB of performance loss on weaker signals you might never notice (you dont see what you dont see)... Here is the best explanation I have seen by John Ackermann, N8UR. Some estimate that 90% of signals on the air are "bad" in that they were never adjusted for optimum settings of level, deviation, preemphasis, tone skew, deemphasis, balance, and impedance, etc. Fix it (usually at the transmitter) if you want to be seen. APRS Operations Tip: There are several different ways to optimize your APRS mobile operations depending on the immediate situation. One way to rapidly select between them without having to go through menu's is to simply program several radio channels with the different settings. The beauty of these channel suggestions is that you can always leave the speaker volume turned up on the APRS data band and can move between full audio monitoring, to Voice Alert, or to complete silence simply by changing channels. For the Voice Alert to always be functional and not miss a call, operators should never have their APRS band volume turned down. Instead, they can silence the speaker in the presence of lots of voice alert stations by selecting the APRSmute channel. By the way, here is a chart of APRS on 30 meters. SMSGTE is an SMS/APRS gateway that allows two way messaging between APRS users and cellphones. APRS Mobile presentation(.ppt) on how to best use your mobile. Also see Settings for the D700! and (for the D710). Ideas for the ultimate digi. Our Annual Golden Packet Event combines with Scouting's Operation ON-Target Saturday 21 July 2012 1100 to 1400 local time. Prepare a SET Plan for your next Simulated Emergency test See the APRS SET Message web page. APRS is not a vehicle tracking system. It is a two-way tactical real-time digital communications system between all assets in a network sharing information about everything going on in the local area. On ham radio, this means if something is happening now, or there is information that could be valuable to you, then it should show up on your APRS radio in your mobile. See typical oversights and hear my talk on the 3 Oct 08 Rain Report See also some original APRSdos views and concepts overlooked in some new programs. APRS also supports global callsign-to-callsign messaging, bulletins, objects email and Voice because every local area is seen by the Internet System (APRS-IS)! APRS should enable local and global amateur radio operator contact at anytime-anywhere and using any device. See the APRS Messaging/Contact Initiative. .
APRS Internet System (APRS-IS): Like most other Ham radio systems, APRS has been fully integrated with the internet beginning with the efforts of Steve Dimse and the Sproul Brothers in 1997. 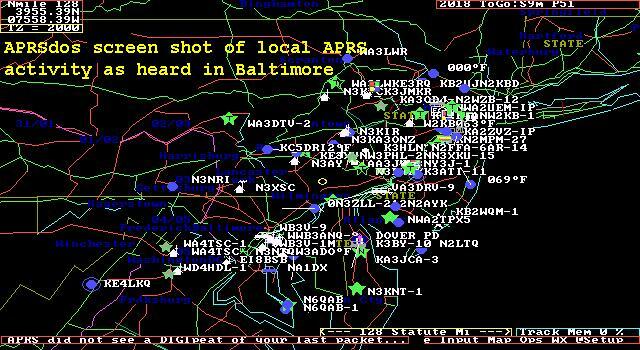 Currently there are many web pages for live viewing of APRS activity such as APRS.FI, or FINDU.COM. For example, the map below from Hessu, OH7LZB's web site http://aprs.fi/ shows a one month snapshot of activity which reveals some gaps in the APRS coverage in the USA. Click to see 2008's animation! APRS SPEC! . APRS continuously evolves. There have been several initiatives that have drastically improved APRS network performance and useability for users. The original APRS spec was updated in 2004 with the APRS1.1 addendum and since then with the APRS1.2 updates. Most of these new initiatives are listed here. CQ SERVER for sending global messages or CQ's using National GROUP Callsigns such as SCOUTS, SCR, IOTA, JOTA, etc. The New-N Paradigm is fixing the USA network. See Southern and Northern Europe progress. See New-N Statistics in Maryland. Default Parser (Vicinity Tracking) to make sure every packet heard gets a posit. See also the original Commented Parser. AFRS Automatic Frequency Reporting System for rapid amateur radio emergency support or locally recommended Voice Frequency Objects. Event and Field Data Entry using the D7 HT. 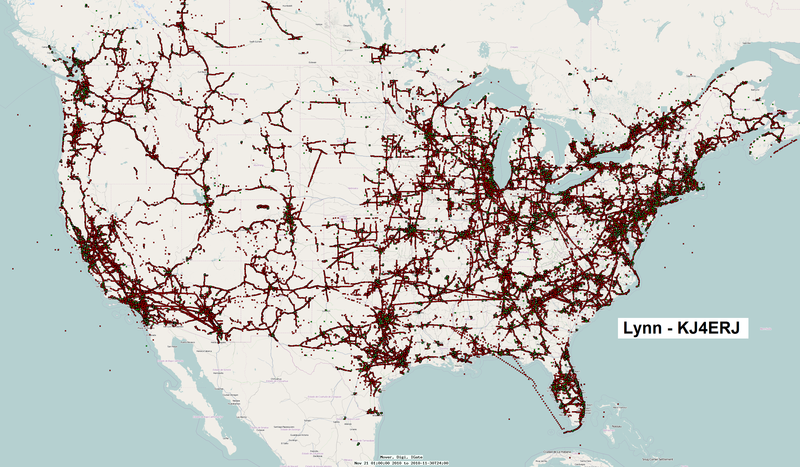 State APRS WEB pages for each area of the country. APRS Satellites . Operational: GO32, semi: PCSAT1, Echo, ISS2, decayed: PCSAT2, ANDE, RAFT, and in-work, P-sat. SkyCommand uses UI Packets just like APRS and can be commanded from APRS HT's and mobiles. APRS Special Event Ops for keypad data entry at special events. Query the QRZ database from your HT or mobile! Worldwide Digipeater maps by WA8LMF. APRS-IS Core and Tier-2 servers web pages. National Parks with APRS coverage. 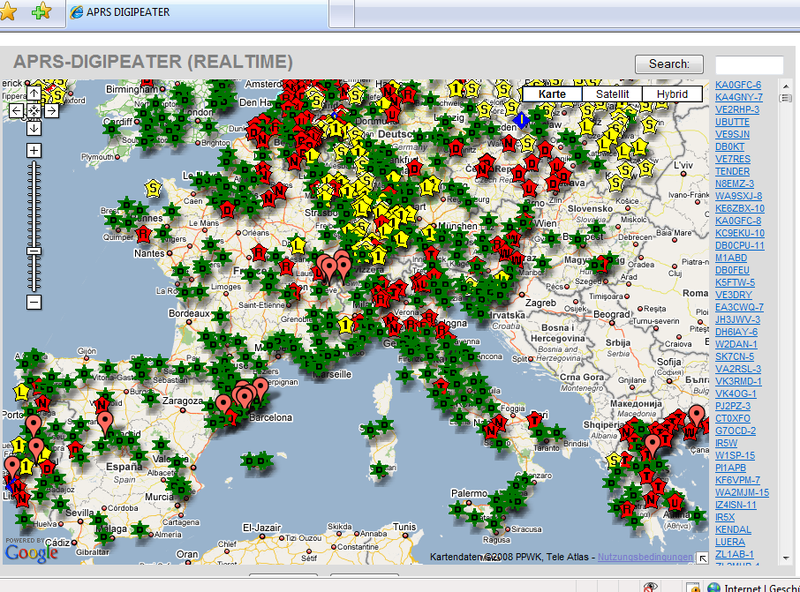 MileMark database for position of non-APRS stations. Description, and Basic code, and mm-data.dat file. OVERVIEW: The Automatic Packet Reporting System was designed to support rapid, reliable exchange of information for local, tactical real-time information, events or nets. The concept, which dates back to the mid 1980's, is that all relevant information is transmitted immediately to everyone in the net and every station captures that information for consistent and standard display to all participants. Information was refreshed redundantly but at a decaying rate so that old information was updated less frequently than new info. Since the primary objective is consistent exchange of information between everyone, APRS established standard formats not only for the transmission of POSITION, STATUS, MESSAGES, and QUERIES, it also establishes guidelines for display so that users of different systems will still see the same consistent information displayed in a consistent manner (independent of the particular display or maping system in use). See the original APRS.TXT. The two images below should give you an idea of the kinds of information available to the mobile operator on his APRS radio. On the left is the Kenwood D710 radio showing the station list, and on the right is the attached GPS with map display showing the location of other APRS stations. Each station or object in the list has three more pages of information on it. The objects can show Repeater frequenceis in an area, meetings, nets, events, hamfests, echolink and IRLP nodes and frequencies, traffic speeds, accidents, emergency situations. And the attached GPS can show the location of each of these items. THE GOAL IS COMMUNICATIONS and LOCAL INFO UPDATE, -NOT- JUST VEHICLE TRACKING! APRS was never intended to be just a vehicle tracking system (GPS was added in the 1992 time frame when GPS became affordable). APRS is much more. See the Kenwood mobile display above. This is the STATION LIST which shows the nearest 100 stations heard. . In this case, not only are the two stations of AB9FX nearby, but also his current VOICE operating frequency is visible. Also, we can see that this radio is in OPERATING range of three voice repeaters that are also identifying themselves as objects on APRS as the locally recommended voice operating channels. APRS provides situational awareness to all operators of everything that is going on in his local area, whether it be Weather reporting, traveler info, Direction Finding, objects pointing to ECHOlink and IRLP, or Traffic reporting and emergency response. All of this while providing not only instantaneous operator-to-operator keyboard messaging capability for special events, but also an always-on Voice Alert backchannel between mobiles in simplex range. There is even an APRS interface to the WinLINK system called APRSlink, so that mobiles can send and receive Email without needing a PC. Think of APRS as a signalling channel to reveal ALL amateur radio resources and live activities that are in range of the operator at any instant in time. UBIQUITOUS OPERATIONS: APRS must work everywhere to be a true resource to the mobile ham radio operator. In North America, 144.39 MHz is dedicated throughout the continent. 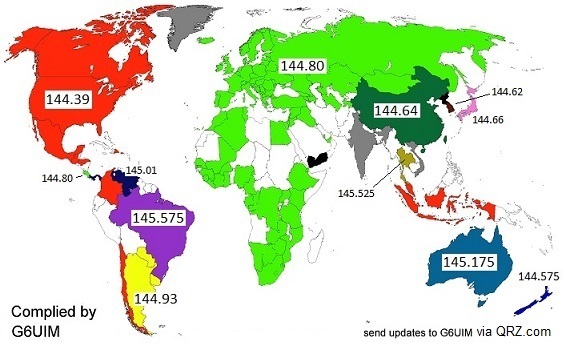 In Europe, use 144.80 and in Australia use 145.175 MHz.. National operating rules were standardized in the 2004 time frame under the New-N Paradigm to eliminate obsolete and inefficient routing. Now, only a 2 hop WIDE2-2 path is recommended in all areasthough mobiles can use the special WIDE1-1,WIDE2-1 two-hop path that takes advantage of nearby WIDE1-1 fill-in digipeaters. See the high density areas in the map to the right. Further, the APRS channel is a resource to inform everyone of nearby ham resources in range. Please see the Local Info Initiative. APRS GLOBAL INTERNET SYSTEM: Although APRS is a local, tactical real-time two-way communications system, all local information is injected into the APRS-IS Internet system so it can be monitored anywhere. Here is the live IGate list of over 1500 IGates that give connectivity throughout the world. Not only does this allow for global monitoring of local activity, it also allows the two-way point-to-point messaging between any two APRS users anywhere on the planet (that has an APRS infrastructure). Everything goes in so it is available to everyone on the internet, but only messages and selected position data goes back out to RF to keep the channel local and lightly loaded. The above left shot was APRSdos in the early 1990's. Now it is world wide linked initially by K4HG's global FINDU.COM shown on the right. 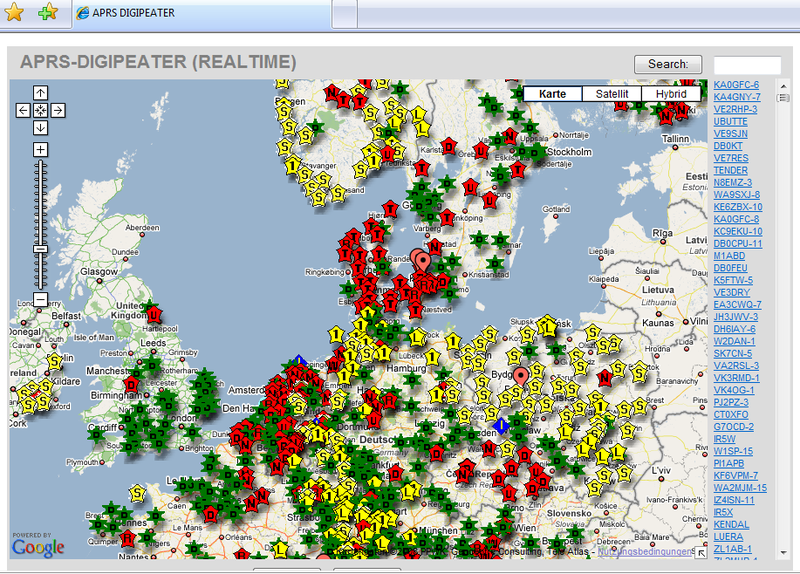 More recently, Hessu's APRS.FI has become popular, as well as OpenAPRS.NET. The map above shows the approximate 20,000 users now on the air in the USA at any instant. All APRSdos Original TEXT files. Select topic by filename. APRS Specification Errata version 1.1 and 1.2 proposals. The "standard" APRS power connector! Vision for APRS. See the Automatic Picture Relay Network, APRN. HAM Hike plan , map , (contact NE3R). ASTARS. Overall APRS Satellite Concepts. 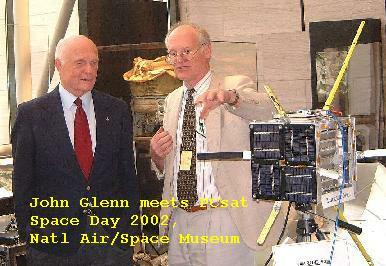 PCSAT-1 partially operational since 30 Sept 2001. MARScom. for Navy Marinecorps MARS (HF antenna failed to deploy). Previous flights: . MIR , SAREX (STS-78), SPRE (STS-72) and TRAKNET, (1200 baud PACSATS). DX CLUSTER Live last two hours worth of DX spots plus information on DX. DAYTON-97 HAMVENTION : Replay of APRS activity last year! Search Google.com for "APRS PACKET RADIO" and get 16,000 hits! www.aprsbrasil.com APRS in Brazil by Tadeu PY1KCF who is also working on an APRS satellite. Download: . . APRS876.zip the original with lousy stick-figure maps, but some useful local RF network analysis displays. Maps for APRSdos: . . Cmaps, Emaps, N-east, NWmaps, SEmaps, SOmaps, Wmaps. . . See INSTALL.TXT. My Solar Prius Unfurnished Annapolis Rental house house for rent. APRS documentation : Documentation on DOS APRS.